Certificate of Professional Competence (Operator CPC) courses for Transport Managers in either Road Haulage or Passenger Operations. This qualification is needed if you wish to become a Transport Manager or Owner Operator. Chevron Training offer the OCR Certificate of Professional Competence with our 10-day classroom based course at our Flint training centre, including exam day. We are an OCR Approved Exam Centre so you can sit the exams at our training centre in Flint. You must sit and pass a Multiple Choice and Case Study exam to qualify. The course and exam covers both National and International Operators. Cost £1,300 including VAT and exam fees. We can also arrange refresher courses for Operator CPC for current Operators wishing to brush up on their knowledge with the latest regulations and information. 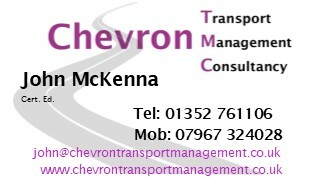 Chevron Transport Management Consultancy can help you with audits, new business and refresher information and guidance on Transport Manager queries, speak with John for your Operator CPC and Transport Manager needs. Here is a selection of feedback from our customers!